A split grad is a square or rectangular piece of resin or glass. Across half of the filter there is some degree of darkening. The transition from light to dark can be either smooth (a soft filter) or very abrupt (a hard filter). They’re used to darken just a portion of an image in an effort to make the dynamic range of the scene more manageable. Split grads are fantastic tools but they have a drawback. When an image has no clear and level horizon it’s difficult to apply the filter without darkening more of the scene than you want. In the case of this image, from near Leidig Meadow, I’d have lost all of the detail in the rocks on the right edge of the frame. I needed another solution. The answer came in the form of the thin black gloves that I was wearing that eveing. To get the color that I wanted in the water I’d already calculated my exposure to be 5 seconds. With 3 fingers in front of the lens I was able to roughly match the triangular patch of sky in the top of the frame. Next I tried several exposures and altered the amount of time that I left my fingers in front of the camera. 3 seconds out of the total 5 second exposure worked out to be the right formula. Since it wasn’t an exact match I did have to do some minor dodging and burning to even out the edges of my “filter” but it was a lot less work than trying to repair the damage from a traditional split grad. The best part is that a quality split grad from someone like Singh-Ray can set you back $175. Fingers are free. 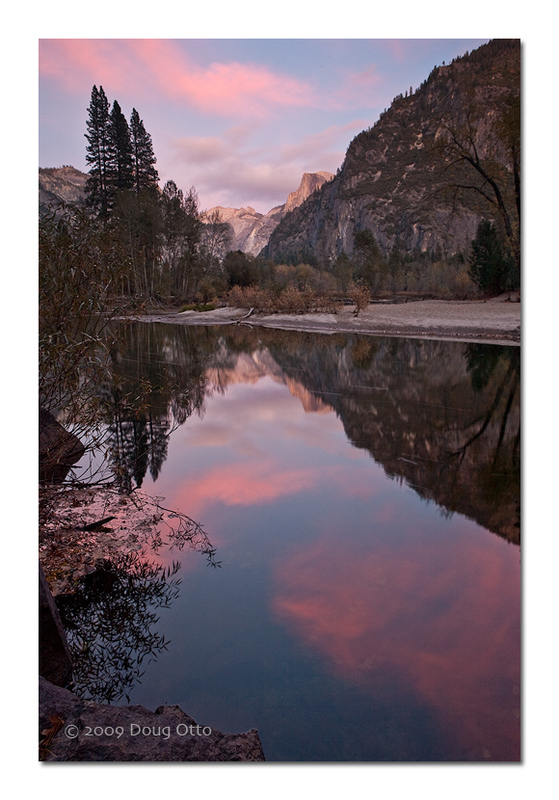 This entry was posted in Photography and tagged Canon 24-70 f/2.8L, Canon 5D, doug otto, dynamic range, half dome, Leidig Meadow, neutral density, reflection, Singh-Ray, sunset, yosemite national park. Bookmark the permalink.